Looking north from the South Loop at the Chicago Skyline. 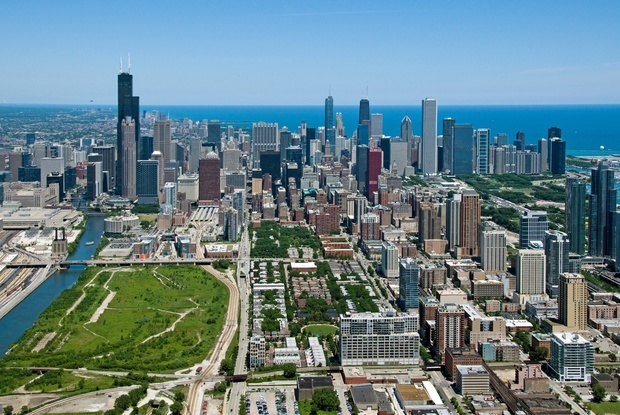 The Loop and South Loop are by far the fastest-growing neighborhoods in the city, a trend that won't stop anytime soon. DOWNTOWN — The city of Chicago is shrinking, but its Downtown core certainly isn't. Recently released U.S. Census data confirms what many construction cranes make obvious: the rapid growth of the Loop and South Loop despite population loss elsewhere in the city. But the Census numbers show just how wide that gap is between Downtown and the city's neighborhoods: The South Loop's population more than doubled from 2000 to 2014, the Loop's nearly doubled, while the city as a whole lost 175,000 people, or 6.5 percent of its residents, over that same period. While the reasons for Chicago's depopulation are myriad, the factor driving Downtown's growth is simple: development. Chicago's Downtown growth mirrors a trend across many cities in post-recession America that invested in their downtowns and attracted young professionals, retirees and others moving closer to jobs and pedestrian-friendly lifestyles. Though the nation's urban population surge is now slowing down, that doesn't appear to be the case in Chicago: nearly 15,000 more homes are on deck in the Loop and South Loop. "Every time I think it's reaching critical mass there's five more developments," said Geoff Smith, executive director of the Institute for Housing Studies at DePaul University. Of course, the Loop and South Loop had nowhere to go but up. Just 30,000 people lived in the Loop in 2014, and just 22,000 were living in the South Loop, the Census data shows. The more mature Near North Side, a broad area that includes the Gold Coast, River North, and Streeterville, had 84,000 residents two years ago and is still growing. South Lawndale, the community area that lost more people than any Chicago neighborhood this century, still had more than double the population of either the Loop or South Loop in 2014. "There wasn't any housing Downtown," Smith said. "You are starting from a low base. Because of that you're going to see a lot of growth happen down there." And with Millennium and Maggie Daley parks shifting Chicago's tourist centers farther south, and lots of pockets of land still to choose from, developers are moving Downtown in a major way. Related Midwest, which owns the former Chicago Spire site in Streeterville, just closed on a 62-acre tract of riverfront land at Clark Street and Roosevelt Road once slated for more than 4,000 homes. Construction is underway on a 3,600-home development just north along the river at Harrison and Wells streets, and city officials have approved supertall towers on Wacker Drive and South Michigan Avenue. The 19 biggest projects that are planned or under construction south of the river will bring nearly 15,000 new homes over the next several years. City officials hope to capitalize on this with a new plan to set aside proceeds from big Downtown developments for projects throughout Chicago's neighborhoods. Critics have derided the new program as a mayor-controlled "slush fund" with little oversight, but Mayor Rahm Emanuel believes the new "neighborhood opportunity fund" will use Downtown investment to drive growth in disadvantaged retail corridors he feels need a boost, according to local reports. Meanwhile, people who live in the Loop and South Loop hope all these new homes will bring amenities seen in older neighborhoods. South Loop residents badly want a new neighborhood school, especially a high school, and they also think they're lacking an east-west alternative to their main thoroughfare, Roosevelt Road. "More people are great, but we need a new high school," said Tina Feldstein, president of the Prairie District Neighborhood Alliance. "We need to keep people here."